Breakbot-Baby I’m Yours Single- Never mind the hipster-looking man behind it. The disco sound of this track (or tracks, I guess, there are five versions of it) is extremely danceable and brings back the concept of funk. An amateur funk enthusiast myself, I found this track to be refreshing. 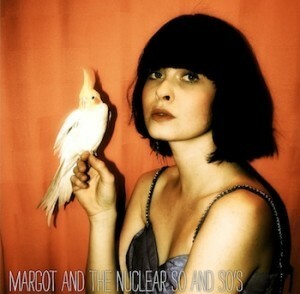 Margot and the Nuclear So and So’s- Buzzard- A melodic yet slow set of songs, Buzzard shows wit and a talent for choruses. I like “Tiny Vampire Robot” but watch for indecencies. The lyrics are hard to find, so you might want to preview tracks before playing them on air. Buxter Hoot’n- If you like folk or country music, give it a listen. These guys know how to use actual stringed instruments (awesome, I know) for a melodic country feel. The Either/Orchestra- Mood Music for Time Travellers- They’ve been together a while, but they still know how to put out a good jazzy jam. I liked “The (one of a kind) Shimmy.” Good album to play during studying/homework. The Graduate-Only Every Time- Warped Tour attendees and fans of Circa Survive will probably enjoy this rock album. It’s not for the indie kids, but I wasn’t against the rock sound of this group that’s touring with my guilty pleasure band (make fun of me all you want), Ludo. HEY GUYS! I COULD USE YOUR INPUT! SEND ME AN EMAIL AT music@kmnr.org OF YOUR THOUGHTS ON SOME NEW MUSIC AND RECEIVE COMPENSATION (not monetary, sorry, I ain’t Daddy Warbucks) AT THE NEXT STATION MEETING.